The Pantech Vega IM-A860 Full HD handset we heard about last month? It seems to be real, and is supposedly arriving next month in Pantech's home turf as the No.6. What does the numbering hint at? Yep, a 5.9" display with the cool 1920x1080 pixels, so this immediately makes it the largest Full HD phone on our small planet. It is said to sport the obligatory quad-core Snapdragon S4 Pro with Adreno 320 GPU, 2 GB RAM, 13 MP camera and LTE radio, plus it will likely launch with Jelly Bean onboard. How would a 6-incher fulfill the trim and fit requirements for modern smartphones is unclear at this point, but Pantech was the first to intro gesture management and ceramic chassis for its high-ends, so we will keep an eye on Mambo No.5, errr... Vega No. 6 in a few weeks. Too bad Pantech's best and brightest are only allowed in Korea, and their parents don't let them play with the low-class versions for the US market that the company churns. 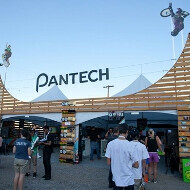 No offense to the Pantech Discover, though, as it houses last year's finest specs at a rock bottom price. I think 6 inch edge to edge display(no bezel at all) with same dimensions of HTC Butterfly,Xperia Z,Galaxy S3 etc is the segment end point for display in smartphone.Beyond that is unacceptable. Too bad, all these 6" phone cannot sell. It is almost like 7" and a lot of tech interested people already have 7" and above tablets. Even 5" phones will have a hard time if phones of the same specs are released with 4.7 - 4.8" screens. We are all interested in 5" now just because the best specs presently are found in 5" phones. isheep, how presumptuous you are. I am more of an android person than you will ever be. Tell the truth to yourself even if you cannot tell it to others, are you going to buy a 6" phone when you can get a smaller phone or if you have a tab? I guess you do not have a tab or you have a 10" luggage tab and you never had a phone with screen size bigger than 3.5", that is why you are talking the way you are. 6" will be too big. 5" still ok and max for phone. Agree. In my opinion everything above 5" is not a phone anymore, bigger is also definitely not ergonomic according to humans physiology. luckily your opinion isn't that of the companies or innovation would be stagnant. I don't have anything against bigger than 5" displays, I just say that device with bigger than 5" display, in my opinion is not a phone anymore. "Why is a 6" screen too big?" For other devices it is not to big but for a phone it is to big because 6" is not ergonomic for average human's hand.